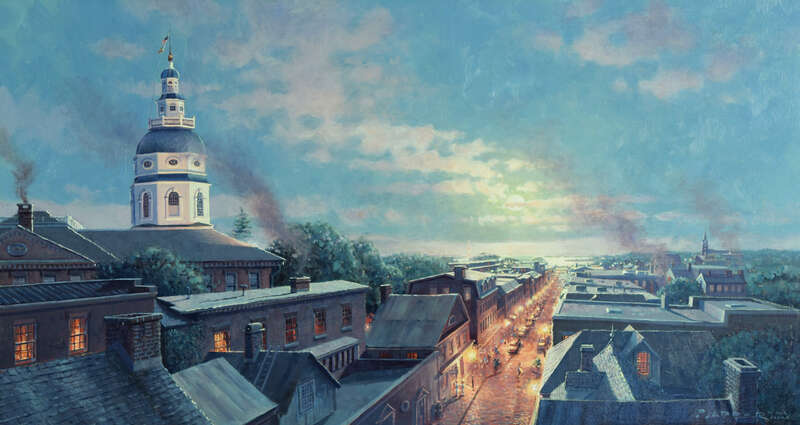 This is a modern-day view down Main Street in Annapolis, Maryland. The viewer is perched atop the Maryland Inn, looking east toward City Dock and Spa Creek. The full moon rises over the Chesapeake Bay, casting its golden light onto the waters beneath. In the glow of street lamps, two Naval Academy Midshipmen stroll up the busy street amid boutique shops, restaurants and inns. 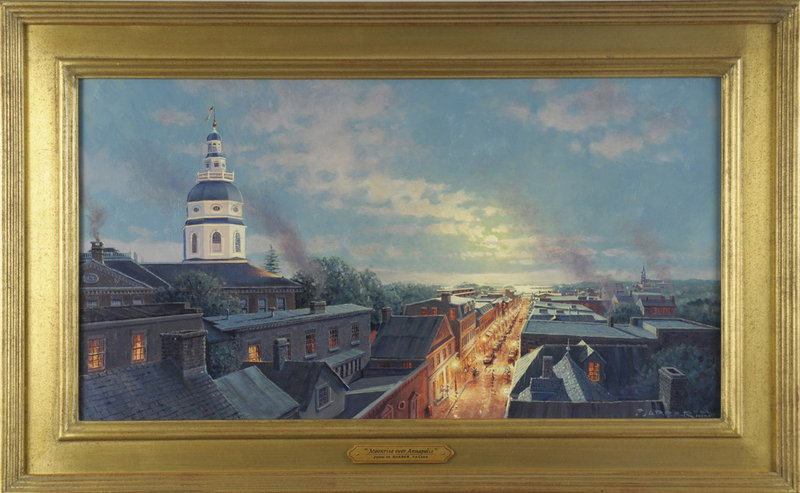 Ascending into the night sky is the magnificent dome of the Maryland State House. Visible in the distance are the Naval Academy field house, Saint Mary’s Church, the Greenbury Point communication complex, and the Chesapeake Bay Bridge, all signature landmarks of a city on the Bay, known for its charm and history. Beautifully presented in a custom-made museum quality, hand-gilded gold frame. As with all originals purchased directly from me, this piece comes with a handsome “House of Troy” painting light attached. Complimentary $120 value in addition to a gilded and hand lettered nameplate. Oil on linen canvas. Art 14” x 26”. Overall framed 19 1/4” x 31 1/2”. $15,000.